If style is the question, then this sofa is the answer. 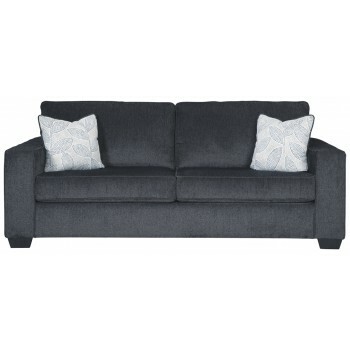 Sporting clean lines and sleek track arms, the decidedly contemporary profile is enhanced with plump cushioning and a chenille-feel upholstery, so pleasing to the touch. Sure to play well with so many color schemes, this sofa in slate gray includes a pair of understated floral pattern pillows for fashionably fresh appeal.